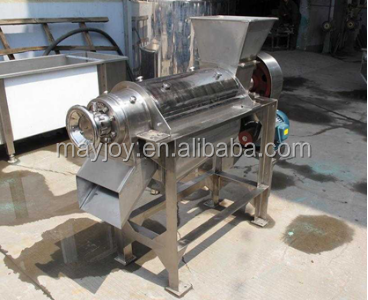 Buy Commercial juice making machine prices/onion juice extractor for hot sale - Jinan Joysun Machinery Co., Ltd. This machine is used to press orange,pine, apple,tomato,etc to make juice.This machine can automatically finish the process of milling,extract juice and deslagging.All the parts touching food are made of 304 stainless steel. This machine is mainly made up of front support,feed hopper,screw,filter screen,juice ontainer,back support and dreg sout. The main component of this machine is the screw. The bottom diameter of the screw gradually increase but the screw pitch decrease when the screw advances along the dreg exit. When the material is pushed by the screw, the screw cavity volume decrease, which forms the press to the material. The rotation direction of the principal axis of the screw is clockwise looked from the feed hopper to the dreg exit. Entering into the feed hopper, the material is pressed by the pushing of screw. Then the juice will inflow into the juice container at the bottom, while the dregs will be expelled out through the cyclic gap between the screw and cone- shape part of the pressure controller. The movement along the axial of the pressure controller can adjust the space of the gap. When you change the space by clockwise, you adjust the resistance to dreg expelling, then you adjust the dreg yield. If the space is too small, some dreg will squeeze out with the juice. Although the juice quantity increases, the quality of the juice relatively decreases. So the space should match with the technological requirements of the users . if you're interested , feel free contact me .